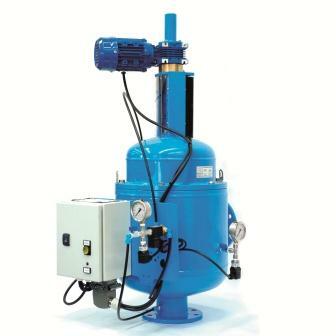 To complete our TwinOmatic automatic self-cleaning filter unit series we offer the TwinOmatic Compact. A smaller and more compact version with a maximum flow rate of 2.200 bbl/hr (350 m3/hr). The Compact is suitable for lighter industries and applications and through its compact design cost effective. Our standard TwinOmatic Compact is electrical driven. The cleaning mechanism uses a unique suction scanner which cleans 100% of the total filter area due to the spiral rotation of the suction scanner with the cleaning nozzles. This results in a very effective cleaning. During the automatic self cleaning cycle there is no interruption of the outlet flow, using only a minimum amount of flush water.